(CNN) North Korea’s sixth nuclear test was so powerful that it’s still triggering earthquakes more than a year later. That nuclear test was North Korea’s most powerful to date, with an estimated explosive yield of 160 kilotons, according to Japan’s Defense Ministry. The blast created an initial 6.3-magnitude tremor, caused a series of aftershocks and reportedly an on-site collapse. The agency said the 2.8-magnitude temblor recorded Wednesday was shallow — only about 12 kilometers (7.5 miles) deep — and struck about 11 kilometers (6.8 miles) east of the Punggye-ri nuclear test site, the only known facility of its kind in North Korea. The site has since been shuttered, North Korea says. The country invited members of the international media, including CNN, to a ceremonial closing of Punggye-ri during which the North Koreans destroyed entrances to at least three tunnels used for nuclear tests, observation buildings, a metal foundry and living quarters. However, there were no independent weapons experts present at the event and it is still unclear whether the explosions rendered the tunnels inoperable, or only caused limited damage. A seismologist at the KMA told CNN that the activity measured Wednesday was almost certainly a natural earthquake rather than an explosion based on the seismic waves detected and the fact that no sound waves were observed. 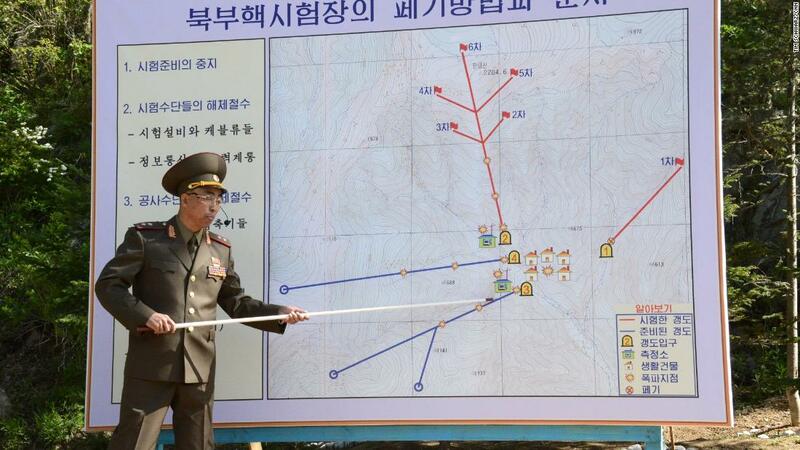 Because no major fault lines run through North Korea and the quake was recorded so close to the Punggye-ri site, the seismologist said it must be assumed that the quake was a result of the sixth nuclear test.